It’s almost time to decorate the Christmas tree and what could be better this year than Twilight Christmas Ornaments? 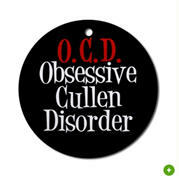 I have been seeing some really cute ornaments on Cafepress and eBay. Amazon also has a small collection. 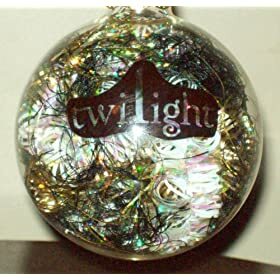 These Twilight ornaments are not available in stores anywhere because they are made by fans and not official merchandise. However, most of the Twilight merchandise that we are seeing is actually made by fans (and some of the most creative Twilight stuff!). The Twilight ornaments on CafePress tend to be flat, ball shaped ornaments made of porcelain with different sayings and graphics on them. They run about $8-10. If you are lucky, you might find some Christmas Cards or notecards to go with them. The up side is that they are professionally printed by CafePress and you know that you are going to get a good quality product. The Twilight ornaments on eBay are much more varied because they are sold by individuals. You’ll find everything from Cullen Crests etched in wood to glass ornaments hand painted with pictures. Do be sure to check the seller feedback before you buy anything from eBay. With the holiday approaching, you will want to get your Twilight ornaments ordered soon so that they have time to ship. ok is it just me or is it weird that there is only 1 ? Finally, they have a name for it!!!! I really need this for my tree. that is so funny!! i need that badly. check out cafe press.com they have loads of twilight stuff! ome they really need more NEW MOON ROCKS!